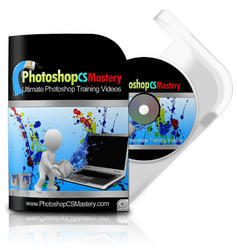 Photoshop provides a tool for automatic color correction; the Auto Color option is available on the Image> Adjustments menu, but this only works occasionally. Here is a more powerful way to use this tool. 1 Examine the image for a color cast. 2 Create a new Curves adjustment layer; Layers>New Adjustment Layer>Curves, name this the "Auto Color" layer. 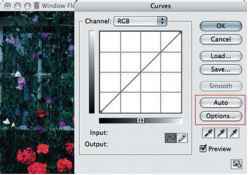 The Curves dialog contains a button for Auto Color correction, and a button for Auto Color Correction Options; Select the Options button. 3 The default Auto Color Correction options are not the most effect options; they mimic the Auto Levels command that can produced odd; but these options can be adjusted to be more effective. Neutral Midtones"; this sets the color correction options to Auto Color. For some cases this works fairly well. Second, set the Target Clipping values to "0.00%" for both the Shadows and Highlights; it is not necessary to clip any pixels in the color balance step, this is best done when adjusting highlights and shadows. Check "Save as defaults". You won't have to reset these when you enter this dialog again. Often, this is good enough. 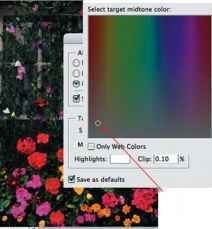 The image window will show a preview using these Auto Color settings. 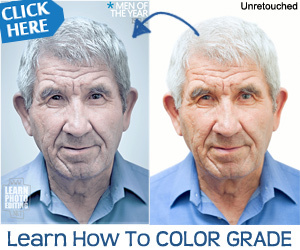 4 Often, the Auto Color Correction improves the color, but still does not properly color balance the image. One step to improve this is to set the Target Color for the Midtones. By default, Photoshop tries to lock the middle tones to an exact Gray value, but sometimes these middle tones should actually be a slightly different color near gray. Click on the gray box for the Midtones Target Color, this brings up the Photoshop Color Picker. 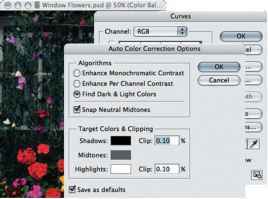 5 Change the target midtone color to a color that provides for a better overall color balance. Set the "B" (brightness) to 50 to make the Color Picker display a field of neutral colors. The color field will now show a full range of neutral colors, try selecting some colors that you feel the image needs to shift towards; just click around in the color picker and the image will show a preview of your image. Once you have picked a neutral color that makes your image look good, press OK to accept your color from the Color Picker, and OK to accept the Auto Color Correction options. The image should now have a fairly good color balance; this process works well for a majority of images, but there are still some images that will require manual color correction.